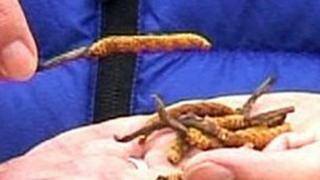 A court in Nepal has found six men guilty of murdering seven rivals in a fight over a rare caterpillar fungus highly prized as an aphrodisiac. The men from the northern district of Manang were all given life sentences. Thirteen other villagers got two years in jail for their part in the murders. Another 21 defendants were acquitted. Foraging for the fungus is a major source of income for poor Himalayan communities. A kilo can fetch tens of thousands of dollars in China. The so-called "Himalayan viagra" case had made headlines in Nepal. Men from the village of Nar high up in mountains close to the Tibetan border were charged with brutally taking the law into their own hands. "Evidence showed that the six were directly involved in the murder while the rest had provided indirect help," local court official Shambhu Baral told AFP news agency. He said those given two-year sentences had already served their time. The court heard how in June 2009 the Nar villagers formed a posse and murdered seven outsiders from low-lying Gorkha district who had come to harvest "yarsagumba". Yarsagumba is the term used in Nepal to describe the mummified body of the Himalayan bat moth caterpillar that has been invaded by the fungus Cordyceps sinensis. It is considered a medicinal mushroom in Oriental medicines and is famous throughout the Himalayas. Many poor villagers see it as a vital source of income. Only two of the Gorkha farmers' bodies were found, thrown down a deep ravine. The local police chief told the BBC he believed the villagers dug up the other five when they realised they were being investigated, cut them into pieces and disposed of them in a fast-flowing river. The trial was concluded in 2010 but verdicts were delayed for months, says the BBC's Joanna Jolly. Sentences were passed on Monday, but the Manang area is so remote it took until Tuesday for the news to emerge. Our correspondent says although the caterpillar fungus has brought wealth to the region, it has also brought jealousy and crime and many locals regard it as a curse.